Frenchy is one girl who has the courage to chase after her dreams and she always does it in style. If you’re ready to chase your dreams like the famous Pink Ladies gal, or you just want some top notch 50’s style, then this officially licensed Grease costume is for you! This Frenchy Plus Size costume comes with everything you need to dress like Frenchy from the hit film. 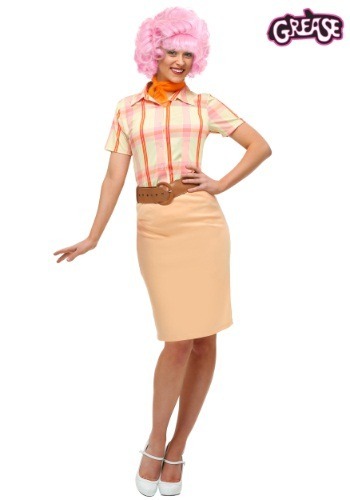 It comes with a plaid button up blouse with a pale orange skirt that matches. It also comes with an orange chiffon scarf to finish off the look. Once you have it on, you can show everyone that you have what it takes to make it through beauty school!